We all know what joint mortar otherwise called mortar joint is and how important it is to your driveway, patios and gardens. As little as it is, the quality of the material used in the little spaces between your pavers can make all the difference that decides between a great floor finish and one that is just gross. Horrible sights like cracks and fissures as a result of a low quality joint mortar compound can be improved with this supreme quality product. Introducing the Joint it Simple, your patio, driveway, gardens etc. can now enjoy an excellent finish. Joint it simple has been influenced by the need to keep improving on the quality of products available in the market today. Although every product of this brand has been engineered to meet the markets best standard, the Joint it provides you with a little bit of extra. As the Uk’s number 1 online supplier of Jointex and Rompox, this has just struck the market with a timely epiphany that is simple to use, highly effective and guarantees the highest quality. Works perfectly for your grooved joint and the end result is that you will have the best patio in the neighbourhood. The grooved joint also known as rolled or concaved joint is usually created with the aid of a curved steel joining tool. Its receding status and tight seal feature requires a high quality mortar joint to make it very resilient and highly optimized for moisture penetration. This calls for the use of a high profile joint mortar and the Joint it Simple remains your best choice. The grooved joint is good for masking tiny irregularities and should be crafted to an optimum depth of 6mm following the initial stiffening. In the grooved joint, tooling should be importantly delayed if you are aiming to achieve a tight waterproof joint horizontally and also necessary to achieve a fine finish. The best practice is to ensure that to get the best out of your Joint it Simple mortar, all slurry covered bricks should use a grooved joint type. This is an exceptional joint that begs for a premium quality mortar like joint-it. Here, the sand proceeds to form a joint that looks recessed right from the top to the base. It will help optimizes the efficiency of the weathered look design to produce a brick work tidy and aesthetically pleasing in appearance. Although this gap isn’t as water-tight as the grooved type a top product is all that is required to make it efficient in all walls and floors. The weathered joint should only be tooled after the initial stiffening has taken place. For the best result after the application of your joint it simple mortar, the tooling should most vitally be delayed in order to achieve a tight weatherproof in a horizontal and particularly vertical joints. The Veed joint is formed with a pointer that is V-shaped. It is highly efficient for masking tiny irregularities. The Veed joint when used with a premium quality joint mortar results in a good joint that is highly weathertight. To get the best of your mortar in your Veed joint design, you should ensure that tooling is done to a maximum depth of 6mm after the initial stiffening has taken place. Just like most paving joints, it is highly necessary to delay tooling in order to ensure that horizontal and particularly the vertical joint produced is tight and weatherproof. The beauty of this type of joint lies it its mode of crafting, the compound is raked out then pointed and tooled in a depth that doesn’t exceed 6mm. For the best result, ensure that your sand compound is compacted to improve the weathertight performance of the gaps between each slab. The use of a premium quality product from us lets this design form a kind of ledge where water can store. This is a special type of space bewteen that is formed without tooling. It is formed naturally by excess mortar squeezing out between the joints. A special design that centers around your compound requires a high-pitched mortar to match and that’s exactly where the Joint it Simple mortar comes in. It is important to use a top quality product because the exposed nature of the design makes the extruded parts prone to degradation and Joint-it has been perfectly engineered to stand this test. In most cases, the type of brick or slab chosen usually goes a long way in determining which product will work best. The beauty of our new range is that it has been perfectly engineered and optimized by Jointex professionals to ensure that it combines perfectly with your choice brick resulting in an elegant and exquisite look. In all types of cases, the amount of product required is usually dependent on the depth, width and length of the joint. This is furthermore a function of the paving slab and the general practice for a standard paving slab is approximately 12 Sq km/15kg. You are advised to purchase slightly more than is required to ensure that you don’t run out during your work. The beauty of purchasing from us is any sealed and unused tub can be returned for a refund if it is no longer required, also even rompox easy can be returned for a refund. Our range is ready mixed and permeable, it has been created with an adequate knowledge of times and seasons and can be applied in all weathers. Here at Jointing Mortar UK we are pleased to announce our new range of Jointing Mortar. We have launched a very sensibly priced 20kg range from joint it . There are three colour available, neutral, grey and dark grey. The starting price for one tub of 20kg is only £49.99. Here are are some useful links and videos on how to use the product. I hope the above videos assist, please do call or email our team for any other assistance and we will do our best to help. During construction works; most especially for homes and offices, the possibility of blemishes been left on the wall can never be overemphasized. In most cases, such blemishes come in form of nail holes or even a more glaring plastering defect which if left not corrected could hamper a fine, fresh and smooth looking wall. At some other time, the need to renovate an already existing structure can demand that some corrections be made to walls of interiors thereby making the need for jointing compound essential in other to enhance embedding of joint tape, finishing gypsum joints, texturing, skim coating and laminating or repairing cracks in plaster and masonry. A jointing compound which could be otherwise referred to as drywall compound, mastic, mud or joint cement is a white powdery substance of primarily gypsum dust which when mixed with water forms a mud-like material used with paper or fibre joint tape to seal the joints in between sheets of drywall to enhance painting on the wall of interiors. Taping Compound: – this is one specifically made for taping and the second coat. It is a strong drywall compound that has very little shrinkage which serves as resistance against cracking when it dries. Topping Compound: – unlike the taping compound which is most suitable for a second coat, the topping compound on its part is specifically produced for the provision of the final coat. It is easy to use, dries quickly and sands smooth and can be applied as coating finishes over taping compound or All-purpose compound. All-Purpose Compound: – this is a type of jointing compound that fits for all phases of drywall finishing whether from the stage of taping to the final coat, even the texture. Among all jointing compound materials, the all-purpose compound is often the most used as a result of its multi-dimensional function. As multi-functional as it is, it doesn’t possess equal strength and quality as achievable with the combination of taping and topping compounds. It is however important to note that all drying types of joint compounds must be with a temperature of above 55° degrees Fahrenheit in other to ensure proper drying. How long a jointing compound will take to dry is also a function of temperature, humidity, and airflow. Setting Type: – Unlike the drying type jointing compound that depends solely on airflow, humidity or evaporation to dryness, the setting type joint compound is a distinct type of joint material which dries through a chemical reaction and is typically very hard. Aside from the fact that it takes less time to dry, setting type also has excellent bonding capabilities to a variety of surfaces with greater resistance against shrinkage and crack. It is also much harder than regular All-Purpose drywall mud. Despite the numerous advantages that the use of a setting type has, it is also without its own shortcomings when compared to that of its drying type counterpart. It is relatively harder to sand thereby making it a matter of extra effort in other to arrive at a smooth joint or patch when being used thereby making it a bit more difficult to apply. Also, it is a type that sets up quickly which implies that one should only mix the amount that can be used within a very short time in other to avoid waste. Special Type Jointing Mortar: – when walls are built for special purposes such as firewalls (meant to resist the spread of fire), the use of a special type joint compound is also a necessary factor to consider in other to enhance the purpose for which such walls are built. It is mostly with reduced dust formulas which cause the dust particles to clump together thereby falling out of the air sooner than regular formulas by reducing airborne dust. Moisture and mold resistant formulas are also special type joint compounds available. To a layman, a construction work starts and ends with setting and plastering of walls. At times, men often wonder how a previously haggard looking structure is transformed into a blemish free smooth texture. This is one reason why the use of jointing compound is essential in the realization of a near perfect structure with a smooth and unblemished painting. Patches and Repairs: – the powdered setting type joint compound is one specifically designed to enhance a quick repair of structures as it avails one the opportunity to patch and even paint on the same day. Finishing Touches for Entire Room: – for unprofessional usage, the drying type joint compound is the recommended jointing compound to be used while a professional finisher could employ the fast drying setting type. They are also mostly used to employ finishing touches to repair works either in rooms or offices. Such finishes include fasteners, damage, drywall tape, holes, bumps, tears, and other minor damage. Texturing: – this is another important function to perform in the realization of a good looking home. When a large area within the home is in need of texturing, the All-Purpose drywall mud is most preferable as it dries slowly, much easier to work with and require less of professionalism. As important as it is to know the different types of jointing compound available, it is more important to know which best fits for any given task required at any point in time. While this material might have provided with the basic information required in other to determine the type that best fit for a particular task at hand, getting expert advice from authorized easy joint jointing stockists can also be another wise way towards ensuring that the most informed decision is made. What is the best jointing compound to use, the answer to that question is either of the following rompox or jointex or easy joint. Please do contact us for any further information required. Here at Joint Mortar UK we are pleased to announce exciting news for the new year, we have added the complete range for easy joint to our range of compounds. More information to follow very soon and keep an eye on the site developing more. In the mean time please see below. I used EASYJoint for the first time on a driveway entrance in West Mersea, Essex. 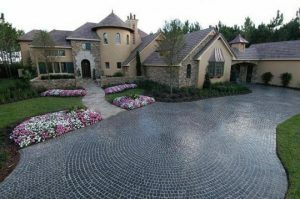 The driveway was constructed from 4000 granite setts, 100x100x50mm. The driveway serves two homes and an osteopath clinic; therefore is well used and a strong and durable pointing mix was essential. I always use a damp 4:1 soft sand / cement mix, thoroughly packed into the joints, compressed and finished with a pointing iron. Never brushed in – I want the job to last more than 5 minutes. This of course is time consuming and tedious and with this particular job with that number of small fiddly setts, I was looking at the best part of a week for two of us to complete, and I can’t say I was looking forward to it! I mentioned this whilst chatting with the landscape yard manager at Kent Blaxills in Colchester and he told me about this new product called Azpects EASYJoint and said how impressed he was with its strength, ease of use and looks. I admit I was sceptical as I have never been a fan of jointing compounds, in every instance they have disappointed – but after viewing the samples of EASYJoint I decided to give it a go. When it was time to point the granite setts, weather conditions could hardly have been worse. Rain turning to sleet and occasional snow, windy and barely above freezing, conditions which would normally have seen me scurrying home, but EASYJoint works well on a wet surface, and was simply brushed into all the joints. The joints were then sprayed with a hose to settle the compound in, left for about ten minutes and then quickly ran over with a pointing iron. The following day a light sweeping to remove the loose debris, and that was pretty much it! Due to the cold weather it was slow to harden fully, but once the temperature rose the drying noticeably quickened. The end result looked very impressive, the colour was 100% consistent throughout every tub I used and the joints are rock hard and easily withstand the traffic. EASYJoint is very easy to use, flows very easily into the joints and gives first class results. I can honestly say the hardest part about using EASYJoint was opening the tubs! I was able to use it in weather I would never have been able to use traditional sand/cement and instead of a job for two people for five days, it was done by one person in about six hours. I was happy, my clients were very happy – from extensive paving around the house they knew how long pointing normally takes – so were happy with the savings as well as the results. I will be using EASYJoint whenever I can in future, and would have no hesitation in recommending it to any paving contractor. 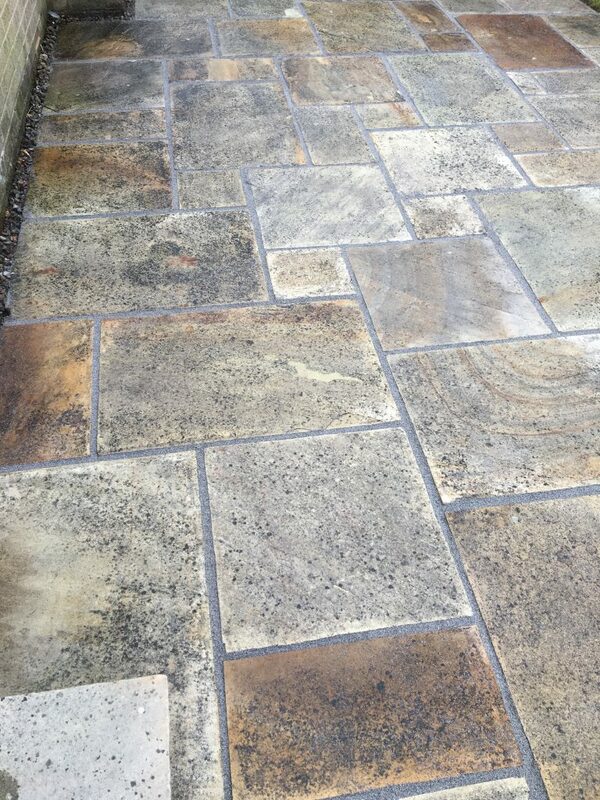 If you have a particiular problem, issue or stain with concrete, natural stone or even tiles you can ask the stonedoctors, they will recommend a treatment, cleaner, service and if required you can purchase the product direct from us. We supply the full range, with next day delivery and totally carriage paid. Granite Work Tops – Oil stains, a great range to clean any stain from a work top. These oustanding products are fantatstic and can tackle almost any problem with your patio or driveway. The Stontex product range has been developed for ease of use, so anybody can have a go at using and get a great result. Also the stonedoctors can assist you with finding a contractor to contact you and quote for looking after your job. Also please do contact us for any advice or assistance. A patio is an outdoor space generally used for dining or recreation that adjoins a residence and is typically paved. It is expanded to include roofed structures similar to a pergola which provides protection from sun, rain and serves as outdoor room to an individual. A well structured Patio thus serves as recreation retreat where individuals discuss, dine and wine together as well as share lovely tales or memory. As good as it is to have a patio; a badly preserved patio can be undesirable and an eye sore. The desire to preserve and beautify a patio however birthed the idea of a patio sealer. Sealer can simply be described as a substance used to block the passage of fluids through the surface or joints or openings in materials and to keep the paving slabs looking new and clean. Why Do You Need Sealer for your Patio? Aside that a sealed patio will have a rich colour and glossy sheen, it also serves as stain protection. In the great outdoors, there are a number of things that can leave unsightly stains on the surface of your patio such as leaves, dirt, pet urine, oil, spilled drinks etc. The right sealer will keep all these from penetrating the surface of the concrete, paver etc and leaving an unsightly stain. A sealed concrete patio also reduces the chance of freeze thaw damage which can cause cracks or surface flaking through water penetrating the surface of the concrete and then expanding as it freezes. A sealer will keep water from sinking into the patio. To preserve a patio, the use of patio sealer is thus a matter of necessity. What are the solids content (usually stated in percent solids)? What is the resin type- acrylic, polyurethane, epoxy? One of the great benefits of using a company that serves as a one-stop-shop for all your landscape design needs is their ability to provide a large option for sealing choices while at same time offer expertise advice on the type of sealer that best suit your patio design. A good looking patio is about more than the tiles that you put down. It is about more than style and aesthetic, even if those are essential. You need a good jointing mortar when putting the patio together to make sure that it not only looks good, but that it stays in one pieces and remains durable, too. You want your patio to last the test of time and you want it to stay with you. You want to avoid major costs down the road, you want to keep the style that you chose today, and you want to avoid changes in appearance that could make the patio less appealing or less safe. Our range does all of this in a simple, effective manner. It is an essential piece of any patio build and you want to choose your product wisely. It is why brands like Jointex and Rompox are some of the best available for your patio needs. You can get the colour to match your patio, and you can trust that it will look beautiful and work exceptionally well. It is what your patio needs. Neutral, Sand Stone Grey and Basalt are available in both brands. A patio is not built by throwing stones or tiles on the ground and letting them sit – at least not a good patio. A patio requires stability and durability, and a lot more than just the tiles themselves. You have to make sure that, whatever you build, there is a good structure there. When the tiles go down, they have to stay there and stay there strong. They have to withstand weather and regular use, and they have to stay there for years to come. A good foundation and good products can manage this successfully. It is how you create a strong and high quality patio. Whatever you want your patio to become, you want it to stay with you for a long time. Part of this is the jointing mortar. This goes in between the tiles. When it goes in between, it can keep water and other problems from going underneath the tiles. If water were to go underneath, it could cause rapid deterioration of the foundation. This results in cracks and weakening of the entire patio. It breaks down, it becomes unsafe to use, and it becomes costly to repair. The only way to avoid this is to have a high quality mortar. Jointex and Rompox are the choice for consumers and professionals. Both Jointex sand stone grey and Rompox basalt for example, offer a variety of advantages. They are both easy to use, effective, aesthetically appealing, and high quality. You can choose based on which you prefer personally without worrying about loss in quality. They are both excellent options that will give you everything that you need out of such a product. There are color options available to you. Both, including romex have several choices, allowing you to pick the one that best suits your patio. Light or dark, or in between, there is a colour that you will adore and that will match your patio beautifully. You can find colours that will match natural stones and modern patios alike. The jointing compound can fit with your overall design perfectly. It can even stand out on its own, or you can use it to blend everything together. Whatever aesthetic difference you want out of jointing mortar, it can do it. The colours look spectacular, and keep that appearance for a long while. With regular upkeep, your patio will remain beautiful. Actually using is simple. You do not need to be a professional or expert at all. In fact, you can do this even if this is your first patio build. It takes little effort and time to do well. It applies evenly and quickly, and then dries in a short amount of time, depending on the weather. Once dried, it will remain in good condition so long as you take care of the patio. Both brands are incredibly straightforward and simple to use. To use, you will have to empty a bag on to the wet patio. Using a broom, start pushing it into the cracks between the tiles. Do this until it has filled the entire patio fully. Thanks to the sand-like consistency, this should be no problem for you. It moves without any effort put into it. There is no need to bend down or exert a lot of effort. A broom can move it around as it would regular sand. Do not worry about excess – that is normal. The excess mortar is swept away. Using the broom and a hose, you can have the rest of the mortar cleaned out. After removing all of the excess, you wait for it to dry. This does not take long, usually around a day, but it does depend on the weather. There is nothing else for you to do. Really! Our jointing mortar range is one of the simplest products to use. It is a sand-like product that takes no effort or time to apply, and it dries and finishes cleanly. You do not need any special talents or skills or knowledge, or even equipment. A broom, and a hose are all you need. Anyone can begin using it without any worries or concerns. Whatever type of patio you own and whatever mortar you want, you should buy it right away. Finish your patio cleanly and beautifully with the perfect finish. It will add aesthetic value and longevity to your patio with ease. Using it is a cinch, there are no downsides, and there is a lot for you to gain. With the colour options available, for both Jointex easy 15Kg or 25Kg and also Rompox easy 15Kg, you should have no trouble getting started today. Prices are affordable and is easy to use right out of the box. Use it and watch your patio transform. It is one thing that every patio needs as a finishing touch. Also do check out our range of D1. Ah, the outdoors! A beautiful and remarkable place, filled with the wonders of nature and the magic of adventure. Just because you have settled into suburbia doesn’t mean your outdoors has to be dull or boring. You can have a fun, thrilling backyard without too much hassle whatsoever. One of the most pivotal parts to having a unique, impressive outdoor area is laying a patio. The patio is a crucial aspect, showing off personal preference as well as giving you space for design. This region is where you can put your grill, your outdoor furniture, your fairy lights. This patio is the mysterious threshold, on which you stand to observe the majesty of all that lies before you. You should, subsequently, make sure it’s sturdy, dependable, and attractive by using one of our jointing mortar style products. When you want to lay a patio, you have lots to consider. It is of the utmost importance that you do not simply jump in without discerning each of the features you will be utilizing. You need to determine where your patio is going and how far it will extend, draw up detailed to-scale plans and keep in mind permanent fixtures. You’ve got a lot to do, so you need to be prepared. You can cut slabs yourself or use half-slabs, stagger brickwork or lay a pattern. You have rules and regulations you must abide by, and you will need to have joint compound to keep your features together. Your patio must slope slightly away from the house to prevent water damage, and calculations are more easily performed using square meters. You’ll have to mark out the physical space for the patio before you begin laying, keeping in mind manhole covers and the like. Keeping the slabs appropriate and fixing on your features is going to be difficult without the right kind of product. Jointex is superior to the majority of alternatives on the market, ensuring your patio will be attractive and dependable for years to come. You have to remove turf and plants, dig for the foundation, and apply a firm base, so do not let your mortar choice drag down your work. D1 is the most capable and appropriate for any patio, and it excels the final look of the patio even of the most complex of fixtures. This product video should assist with information for the likes of rompox easy , romex and the complete jointex range of jointing compound. Any questions or queries please do email or call our free helpline.